At this time of year, when our #citylis Masters students are just embarking on their dissertation projects at City University London, it seems apposite to reflect on what an interesting set of dissertations our students do each year, and what a contribution this aspect of the course makes to the professional knowledge base. While this kind of research is sometimes looked down on as “just a dissertation”, the better ones can be valuable resources; as recognised, for example, by the Dissertations into practice section of Health Libraries and Information Journal. This, of course, is in addition to its benefits for the students’ own learning, development as professionals, and – on occasion – job opportunities. Our students can choose any topic for their dissertation, providing only that it is ‘do-able’ and has some relation to library and information science. They cover the spectrum for academic and theoretical to practical and vocational, from solitary study to action research in a workplace, and from library-based conceptual analysis to extensive empirical data gathering. •	developing a file structure for information management in an investment bank. 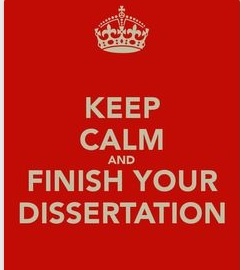 So, and it’s a small thing, but maybe we could agree not to say “just a dissertation” in future.